The Meditation Room project emerged from the exploration of the ideas of horizon and peripheral vision. Meditation Room: Horizon was installed in Sara D. Roosevelt Park on the Lower East Side of New York City, for one day -- Saturday, May 30, 2015. Presented by The Drawing Center during the New Museum’s Ideas City Festival, the installation created the sense of an expansive horizon in the smallest of spaces. Balmori Associates’ “Meditation Room: Horizon” is a constructed continuous wall of paper where the overlapping of two dot matrix systems comes together to create a visible horizon. A city is distinguished by the presence of multiple horizon lines stacked one over another. A task of landscape in the city then may be to create the sense of an expansive horizon in the smallest of spaces. You are invited to meditate on this concept of the horizon and to draw your interpretation. All landscapes are temporary; everything around us is. Some landscapes are temporary by design: the viewing fence around Ground Zero, which will be removed when the construction planned for the site is completed, for example; or the temporary landscape built on a derelict site in Brooklyn, until the site is used for another, more permanent, project. We see great value in temporary landscapes for cities. They can serve to try things out, change the character of the place, fast: the Garden That Climbs the Stairs in Bilbao was designed and built in three months. Temporary projects are also often low-budget interventions allowing for ideas to be tested. Realizing Robert Smithson Floating Island to Travel Around Manhattan Island showed us the potential for the floating typology to occupy and negotiate shifting landscapes such as a river. With Hyperambulation BAL/LAB and Dr. Novella envision paths that are for rehabilitation as well as simply for the pleasure of walking. The paths can incorporate challenging topography to help restore a patients’ balance and timing; to correct gait or sequencing in running; and to improve strength and range of motion after a hip replacement, a back, knee, or ankle surgery or sprain. Some paths maximize strength of specific muscle groups, such as ankles, calves, hamstrings and quads, or improve balance and flexibility. These paths are for healthy persons who wish to improve their potential speed, agility, or balance. These paths can be grouped, and then designated to improve performance of athletes such as racket sports players, football players, basketball players, runners, dancers, etc., or designated to improve strength and flexibility and balance. These paths are designed as the basis for a landscape taking maximum advantage of the aesthetics of the local environment. Such a project can stimulate body and mind, and has universal appeal. 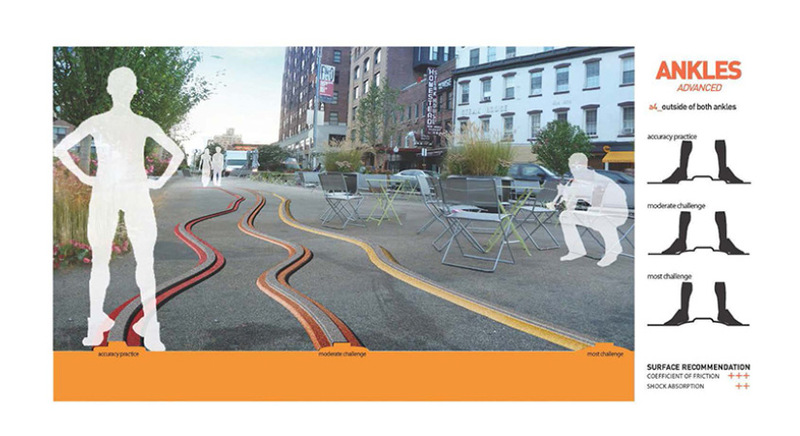 These paths can be incorporated into the existing grounds of parks or other public spaces, people’s backyards, in health spas, or hospital grounds. They can also serve as features to attract the public to sites developed as places of scenic beauty like national parks. What’s all the fuss about green roofs? These roofs can be a modest planting, sometime of a single species. Sedums are very resistant, can live on very little water and very shallow soil. This modest planting can create a microclimate. Microclimates are the ecological movement’s next frontier. The evapotranspiration from these plants lowers the ambient temperature on this roof resulting in a cooler place, requiring less air conditioning. Furthermore the water from rain is absorbed by the plants and returned to the atmosphere or filtered through the soil, delaying it entry into the drainage system, lessening peak storm loads. These green roofs can play the role of fifth facades in high rise cities like New York. Where people look down from above at other’s rooftops, green roofs become an aesthetic asset. Let’s add to that, that it triples the lifespan of a roof; and that it traps air-borne pollutants, producing oxygen. The big picture is that half of the world lives in cities; it will be 2/3 by 2025. Cities are major producers of all the things which are feeding climate change. Green roofs are a simple tool we could use to change this effect, if used at the macroscale. Green roofs can also play the urban role of open space and social connectors. In landscape architecture, representation has become the subject of contention and much discussion. While computer techniques have been a catalyst for change across the field of design as a while, nowhere have the conventions of representation been called into question more than in landscape architecture- which in itself is undergoing a process of reinvention. With the onset of rapid urbanization and our shifting relationship with nature, landscape architecture has proved a potent lens for expressing a wider dialogue taking place in the world. It is, however, only through the introduction of innovative forms of representation- whether digital, analogue or hybrid- that one most vividly sees the emergence of the new. Similar to green roofs or traffic medians, floating landscapes exist on the edges and underutilized spaces within cities. Whereas green roofs exist as an intersection between landscape and architecture, floating islands are a model of the interface and transitions between the river, the landscape and the city. There are many social and ecological benefits to a network of floating islands or floating landscapes: They are exciting opportunities for new recreational public space. They can move to accommodate civic spaces and parks and serve different neighborhoods on a seasonal or weekly basis (rather than build redundant facilities throughout a city.) Islands act as sponges that filter and clean water and provide wildlife habitats in the city. Floating islands also adapt to and address rising seas. But we wondered: how could floating landscapes become financially sustainable? Floating landscapes could offer a framework for an infrastructure to capture the energy of waves and currents. And they could also grow food! The great Aztec civilizations produced agriculture on artificial floating chinampas and Bangladesh developed floating societies. Thailand’s floating markets are tourist and local economic drivers. Vice President for Botanical Science and Director and Philecology Curator of the Institute of Economic Botany at New York Botanical Garden, Dr. Michael Balick suggested growing herbs. Herbs are low maintenance compared to other crops and have a financial return that could make the floating landscape an economically viable scheme. Balmori Associates produced Robert Smithson’s Floating Island to Travel around Manhattan Island for the Whitney Museum and the Smithson Estate in 2006. The project, which takes a piece of Central Park and places it on a barge to travel around Manhattan showed the potential for the floating typology to occupy and negotiate shifting landscapes such as a river. 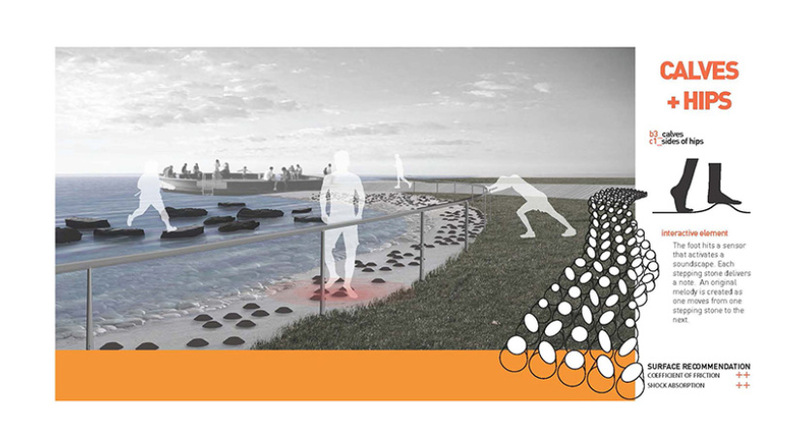 In St. Louis, Balmori Associates, with engineering support from Consulmar Marine Engineers, developed a master plan with public space on floating islands and docks that would rise with the level of the Mississippi River. In 2013 in the Delaware River in Philadelphia, Balmori Associates collaborated with Floating Island International and PennDesign (University of Pennsylvania) to install floating island prototypes made from a matrix of non-woven fibers from recycled plastic PET drinking bottles and a buoyant marine PVC that are non-toxic to marine life. 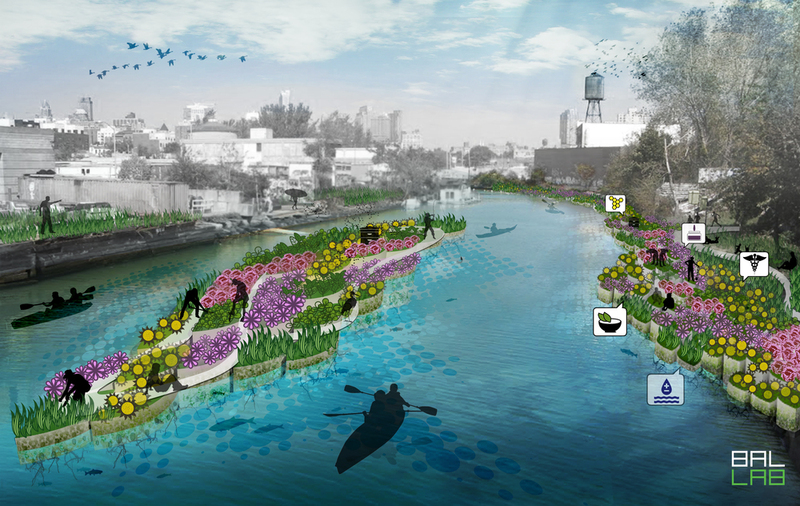 In 2014, Balmori Associates received a $20,000 grant to research and create a productive garden in the most polluted canal in the United States, the Gowanus Canal in Brooklyn, NY. Once a hub for Brooklyn maritime and commercial activity the Gowanus Canal has captured industrial waste products from factories located along its banks and other polluted surface run-off and sewage waste from its adjacent neighborhoods. Balmori Associates’ aim is to clean water through phytoremediation and collect rainwater to irrigate the floating productive garden. Different buoyant construction materials have been tested such as coconut fibers, water hyacinth, bamboo, Ecovative mycelium technology, and matrix of recycled plastic. Our ultimate goal is to show the viability of producing edible floating landscapes at a large scale in cities with polluted rivers and to explore their urban potential as a multi-functional green infrastructure capable of providing public space, biodiverse habitats, and shoreline protection, in addition to food and energy production.